From experience, we know that there are many people out there using their kitchen worktop as not only a place to prepare your daily meals, but also as a workspace too. 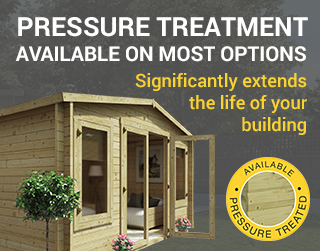 However, did you know that installing a suitable type of outdoor building into your garden could be the solution to clearing out the mess from your house? Not only that, outdoor buildings can be cost effective whilst allowing you to regain control of your own home. Therefore, take advantage of our fantastic range of garden workshops. Our work sheds for sale, are built to accommodate many different types of uses, making them perfect for DIY enthusiasts, woodworking, art studios or even potting sheds. Available as either wooden workshops, metal workshops, or log cabin workshops, there is something to suit everyone's needs. Furthermore, our range of wooden workshops are integrated with special weather board systems that help keep harsh elements such as water, dust, and rot, from damaging the building. This ensures structural integrity and a longer lifespan. We also use different sizes, materials and designs, to offer you the best value for money. Take a look through our range of timber garden buildings for sale and get yourself a trusted workspace. In addition, a workshop is ideal if you are needing that extra bit of space, which a shed simply won't cut. Here at Garden Buildings direct, we have an amazing range of workshops for sale, which are designed to suit you. Using either, tongue and groove, or overlap panels you can pick out the most suitable design for you. And, with such a multitude of sizes, you don't have to buy more than you need. A wooden workshop sticks to an authentic look and is best suited to those looking for a more traditional style of workshop. Available as pent sheds, corner sheds or corner log cabins, the toughened glass windowed options available allows you to have a convenient source of natural light coming into your workshop unit. Whereas, a windowless design, however, gives further security with everything out of sight and out of mind. Timber garden buildings can come in many styles. For instance our reverse workshops offer centralised double doors, so gaining access to the unit with large or heavy power tools has never been easier, these are ideally suited at the back of a garden. Overall, timber buildings could be the perfect wooden garage, log store or could even be used as bike sheds. Alternatively, our metal workshops are a more heavy duty style of outdoor building. They use hot -dipped galvanised steel panels for enhanced durability. Galvanised steel can help to prevent long term weather damage. This can help prevent damage such as rot and corrosion. Furthermore, a metal workshop offers a longer lasting unit and as the steel of the building is roll formed with deep ribs for added strength. Furthermore, a metal workshop is fire resistant and requires no treatment, this makes it easy to maintain and is perfect for those looking to carry out potentially dangerous DIY projects. With a wide variety of sizes and designs, we have something to suit any garden design, no matter how obscure, it all depends on what it is you are looking for. This means in no time, you will be able to move all of the mess out of your house, and instead take ownership of a well organised DIY workshop building. However, please consider whether your outdoor building will require planning permission. This is as although most garden buildings do not require planning permission, there are a few exceptions. Therefore, it is recommended to check with your local planning permission authorities.